One of my goals with this survey is to inform students about services available as well as gather information from them. The final two questions on the survey fall into this category. Inside Desire2Learn we provide an optional tutorial titled “LSC Online Skills” that new students are encouraged to use to learn about course navigation, technology requirements, word processing expectations, and how to use various tools inside D2L. Question 24 is used to determine how many students have already used the tutorial or are planning to do so (the survey is given at the very beginning of the semester), and also to help inform students that this resource is available. 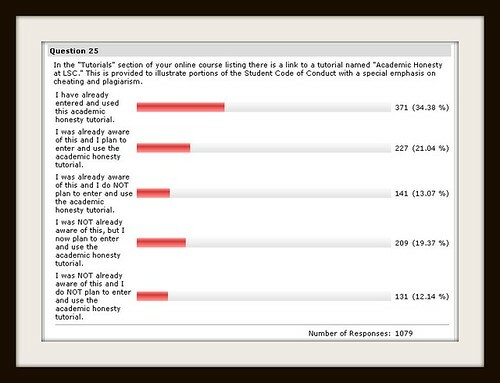 The survey indicates that only about 27% of the students have gone through the tutorial, that 36% are planning to use the tutorial, and that 36% DON’T plan to use the tutorial. 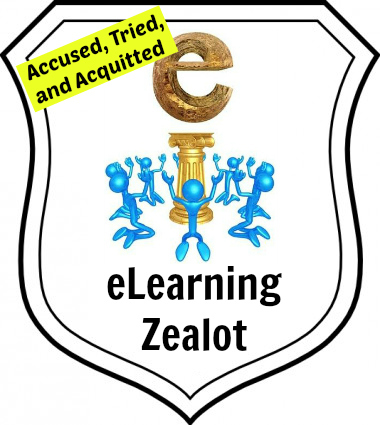 Question 25 is similar in that we also use a D2L course shell to provide information in each student’s account about academic dishonesty and plagiarism. The tutorial is titled “Academic Honesty at LSC.” Several instructors have included a requirement at the beginning of their courses for the students to go into the utorial and report back in some form about something they learned in there. Only 25% of the students report that they are NOT planning to visit the academic honesty tutorial, and there are 35% that have already done so. I was initially a little surprised that more students were using this tutorial than the online skills tutorial. 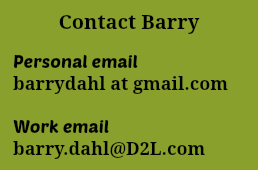 Most likely that is attributable to the directions that students are receiving from their faculty members. 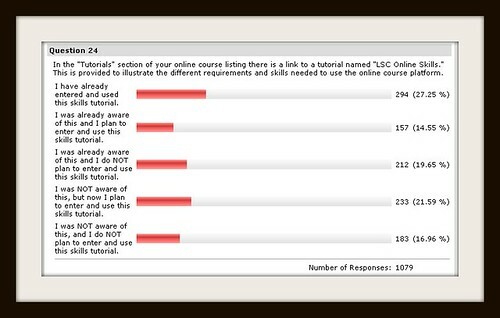 That is the end of the questions for the LSC Student Technology Survey for 2009. Hallelujah.